It seems like everything in the world costs too much money these days. Your kid needs braces? Your wife wants to go to Hawaii? Your dog ate part of a couch cushion and now he needs some special surgery? You can bet you’re going to have to dig deep in those situations. (You wouldn’t believe what they’re charging for special dog surgery these days.) 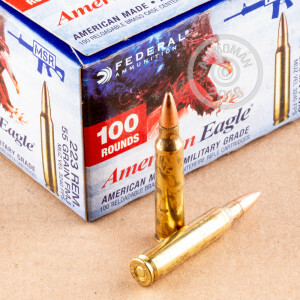 That’s why it feels so good to get free shipping and handling when you buy ammo from AmmoMan.com! 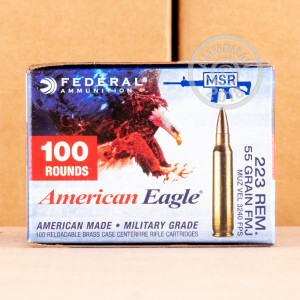 This 223 Rem cartridge from Federal’s American Eagle line of ammunition is all about giving you maximum value at the range. Its 55 grain projectile features a boat tail design which massively ups its ballistic coefficient, giving your shots better accuracy and greater resistance to wind drift. The bullet’s full metal jacket means you won’t have to fumble around with a cleaning rod at the range, too. With its reloadable brass casing this cartridge delivers at home just as well as it does at the range, so stock up on these 1,000 high quality rounds today! Great service, even better Ammo. Put 500 rounds through my M&P Sport 2 AR and it fed and rejected rounds flawlessly. Would recommend. Prices are great and shipping is free and fast!! 5 stars!